My annual guide to Getting the Best out of BETT is pretty much complete. I’m just waiting for one more item to be sent to me, and then it’s all systems go. I’ll be making it available to subscribers to our newsletter first, and then more widely. In the meantime, I thought I’d publish a few extracts from it. These extracts are just a small sample: there are over 150 suggestions altogether. 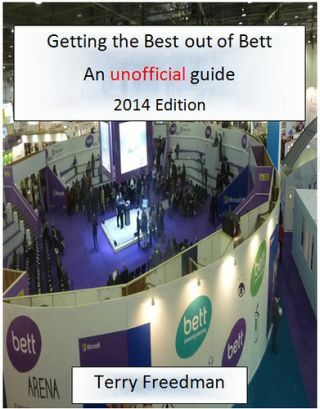 The cover of the new, stupendously useful, and FREE guide to Bett 2014! Some teachers have an unfortunate tendency to display a bit of an arrogant attitude towards exhibitors. While there are undoubtedly some exhibitors who see education as fertile ground for easy pickings, in my experience most are not like that. Many have been teachers themselves, and all of them will have consulted, and had their products tested by, teachers before coming to market. So they probably have more experience of what works in the classroom, albeit indirectly, than you might think. In any case, it’s the exhibitors who make Bett possible in the first place. If you think they’re beneath you somehow, that says more about you than it does about them, and you may like to read Pete Yeoman’s “No such thing as free” for his (rather angry) take on this. In fact, read it even if you’re not like that because it’s a good read and spot on. An odd thing to suggest, at first glance, but before signing on any dotted line in order to enjoy a “special show price”, take time afterwards to check out alternatives. For example, I imagine quite a few companies will be launching new schemes of work and lesson resources, but there are quite a few free ones available, so it’s worth taking the time to do a proper evaluation of the various options available. This is the corollary of the preceding point: do ask for samples or a free trial so that you can fully compare the commercial product with its free alternatives. Not everything that’s good is free, and not everything that’s free is good. Just because something has a price doesn’t make it good quality. I have never really understood the idea of having cheap business cards to give to other people. In my opinion, cheap business cards feel cheap. They’re fine for putting into boxes or jars for a prize draw, but not to represent yourself to other people. Your business card represents you. Do you really want to convey the impression, however subliminally, that you don’t consider yourself worth investing a bit of money in?